Corneal Collagen Cross-linking is a developing treatment for keratoconus and other corneal ectasia which was developed by Theo Seiler, MD, PhD, at the University of Dresden in 1998. in this procedure ultraviolet (UV) light and riboflavin (vitamin B2) drops are used to strengthen the cornea's structure, to slow or halt the progression of keratoconus, and thereby prevent further deterioration of vision and the need for corneal transplantation. Keratoconus and post-refractive corneal ectasia are the second most frequent indications for corneal transplantation in the United States. corneal transplantation has risks that could result in permanent loss of vision, so any treatments such as corneal crosslinking that can delay or prevent the need for corneal transplantation in keratoconus patients is of great benefit. In corneal crosslinking, riboflavin is dripped onto the cornea and then exposed to ultraviolet light, the light causes the riboflavin to fluoresce, which leads to the formation of bonds between collagen molecules. There are two general types of corneal collagen crosslinking, epi-off and epi-on1. 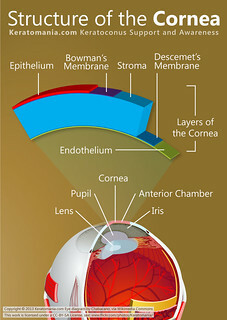 in epi-off method, the corneal epithelium is removed to increase penetration of the riboflavin into the stroma while in epi-on method corneal epithelial layer is left intact. Epi-on crosslinking has some advantages to epi-off method, such as reduced risks of infection, corneal haze and scarring, and faster visual recovery. however, more research has been done on epi-off crosslinking than epithelium-on method, and removing the corneal epithelium layer allows better penetration of the riboflavin into the stroma and results in higher amount of crosslinking. Corneal crosslinking can also be used in combination with other treatments, such as intrastromal corneal ring segments (e.g., INTACS), laser eye surgery and Keraflex, to improve the vision while slowing/halting the progression of keratoconus. Corneal crosslinking is generally suitable for most of keratoconic patients with corneal stromal thickness of more than 400 microns. in thinner corneas, crosslinking could be done by hydrating the cornea and causing it to swell to at least 400 microns before preforming crosslinking. Although crosslinking appears to be effective, with some patients in the European studies having been followed for up to 10 years after the treatments, but the procedure is still under investigation and it is currently in FDA phase III clinical trials2. Most used term for corneal collagen crosslinking. usually referred to the Dresden protocol, which includes removal of the corneal epithelium and UVA irradiation for 30 minutes. Accelerated corneal collagen crosslinking, such as Avedro's KXL system which reduces the UVA exposure time to less than 3 minutes. Holcomb C3-R, epi-on corneal collagen crosslinking method developed by Brian Boxer Wachler, MD, in 2003. Contact lens-assisted cross-linking, a new technique for cross-linking in corneas less than 400 microns thick.